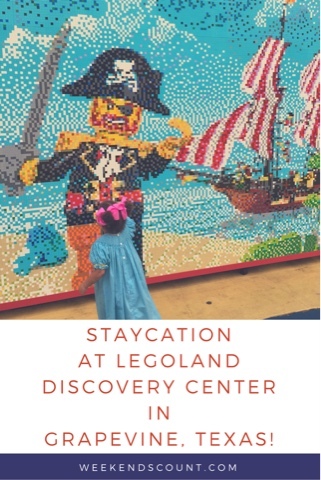 Weekends Count Magazine - Education & Family Travel: Staycation at Legoland Discovery Center in Grapevine, Texas! 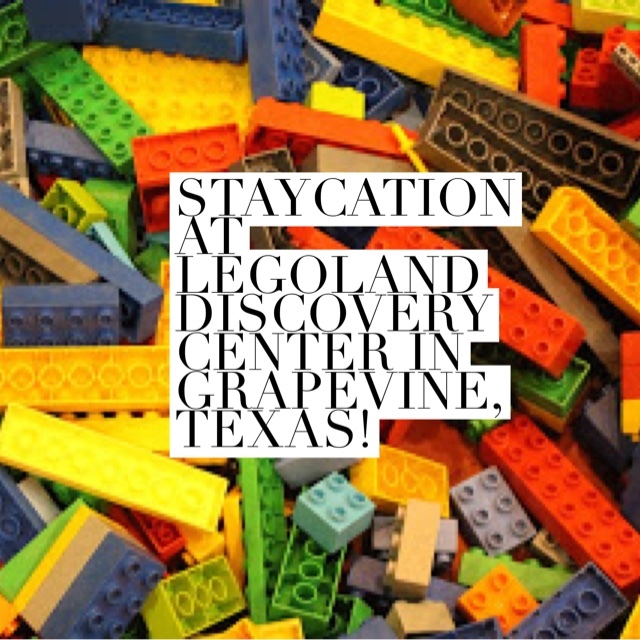 Staycation at Legoland Discovery Center in Grapevine, Texas! If you are looking for a great staycation or family weekend getaway in Dallas-Fort Worth, you should definitely visit Legoland Discovery Center in Grapevine, Texas! Legoland Discovery Center is located inside Grapevine Mills Mall. If you're walking through the mall, you'll know when you get to it when you see one of the large signs. We visited Legoland Discovery Center on International Talk Like a Pirate Day so many of the employees were wearing pirate hats and attire! Once you get your tickets, you will wait at the entrance to the Lego Factory. In the waiting area, you will see many Lego figures, some are even hanging from the ceiling! Once you enter the factory, you will be greeted by Professor Brick who asks for your kids' help in getting the factory up and running. Before entering the rest of Legoland Discovery Center, Professor Brick gives each of the children their very own brick to commemorate the visit. One of the rides at Legoland Discovery Center is Kingdom Quest! In this ride, you get to protect the kingdom from monsters that have captured the princess. Each rider in the chariot gets their own score based on the number of monsters they vanquish! Another great ride is Merlin's Apprentice! Movie lovers will love the 4-D cinema featuring three movies. At the time of this post, the cinema was showing a Clutch Powers movie, a Lego Chima movie, and an international feature. At the Lego Racers Build & Test station, kids can use bricks to create their own vehicles and race them on ramps! There is also an area where kids can build Lego structures and see how they withstand motion similar to earthquakes! Toddlers can enjoy Legoland Discovery Center as well. There are play areas where they can build their own Lego structures. If your kid plays with Duplo bricks instead of Legos, s/he will love Duplo Village! Here your kids will find extra large Duplo bricks where they can hone their building skills. There are even Lego animals like elephants and giraffes to entertain the kids! At the Princess Palace, kids can build castles and sing familiar tunes at the karaoke station! Another must-see area of Legoland Discovery Center is MiniLand. Here you will find miniature versions of popular North Texas landmarks including AT&T Stadium (home of the Dallas Cowboys), Dallas-Fort Worth International Airport, the Gaylord Texan Resort, the Great Wolf Lodge, the Fort Worth Stockyards, South Fork Ranch (home of the Ewing family on the TV show Dallas, the American Airlines Center (home of the Dallas Mavericks and Dallas Stars) and Victory Plaza, and Reunion Tower. Bigger kids (between 40 and 57 inches tall) can enter the Legoland Play Zone and Fire Academy, where they can climb and pretend to be firefighters! If you spend the entire day at Legoland Discovery Center, there's no need to leave for lunch. You can grab a bite to eat at the Cafe inside Legoland Discovery Center. In addition to entrees, the cafe also features lighter snacks and beverages. If your kid dreams of being a police officer or driving a race car, then s/he will definitely enjoy Lego City: Forest Ranger Pursuit! Kids between 4 and 13 years old can drive their own police car along the course. Throughout Legoland Discovery Center are displays of artwork made with Lego bricks, like this one with Big Tex from the State Fair of Texas! Last, but not least, is Pirate Beach, a fun water play area designed for kids. A new addition to Pirate Beach is this new mural featuring Captain Redbeard, a pirate ship, and treasure! For an experience you will definitely treasure for years to come, plan your visit to Legoland Discovery Center! Buy your tickets online to save or purchase an annual pass! Question: Have you been to Legoland Discovery Center? What's your favorite part of the experience?